Well, I persuaded Hubbs to move around my boxes and tubs in the storage area at the old house, in hopes of finding my two tubs of Valentine things. When we moved to the smaller house I brought very little "decor" stuff with me, just the basics. So after wading through the Fall and Christmas (there's a ton of it) I gratefully spied the pink and red, and tried to get out of there as soon as possible. If I keep him in the storage room too long it turns into a disagreement. I know... I know ...I'm workin' on organization! The Entry here isn't large, but it's big enough for my little dresser, a mirror, and a few things that are holiday and seasonal on top. I tried not to overdo it, just keep it sweet and simple. Here's a better shot of the entry before Valentine's jumped on it. If you look closely you can see the dresser is a little different color. Actually, the night before we moved I grabbed my can of taupe bedroom wall paint and decided to give it a little gray/taupe wash. I've mentioned that my "antique white" furniture looks really yucky here at this smaller house...just plain 'ol dirty. and then wiped it down with a wet cloth, taking most of it off. 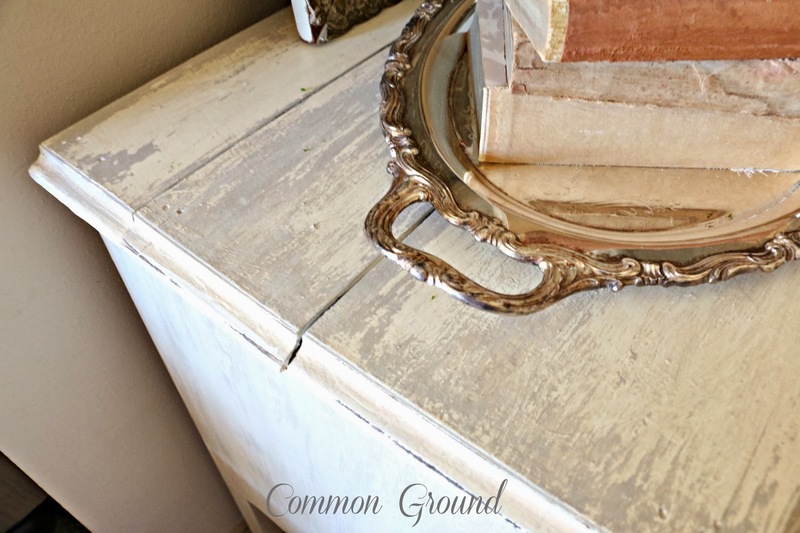 The next morning Hubby said, "what did you do to this little dresser?" and I was surprised when he approved and thought it did look better. So now it blends with the new/old cedar chest and the little accent table. I imagine that this is where most of my "Old White" furniture from the old living room is headed; it will need a wash of gray to work with these sofas. This only took me about half an hour, so that thought isn't too intimidating. None of those pieces are here at the smaller house. One thing at a time, and this last weekend we packed up all the china and antique dishes from the Dining Room. Gosh, what a big job that was. I'm still not finished, because we ran out of foam and bubble wrap, but we're making some progress and that's what we need to see. The new granite countertops go in to the old house this week. Can't wait to see it! Wish we'd made the decision to put on granite while we still lived there. 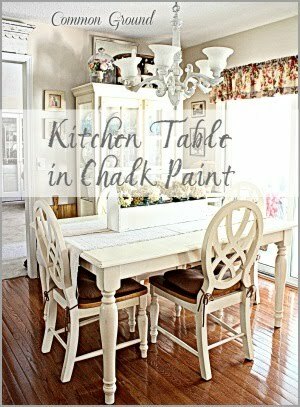 (It should have had it when we bought the house, but the previous owners cut corners in the kitchen) But you know how things go, don't want to deal with the mess, or spend the money. Thinking of selling the house has caused us to realize there were some things that just needed to be updated. So now, someone else will benefit from all the work we're doing. I'm OK with it though, I'm letting things go, and realizing that it's not "home" anymore. We're looking forward to the future. 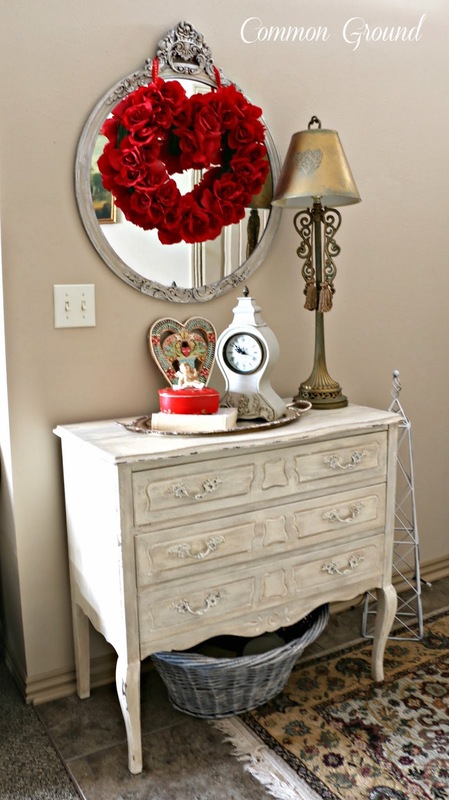 I love what you did with the dresser and the red heart is so pretty! 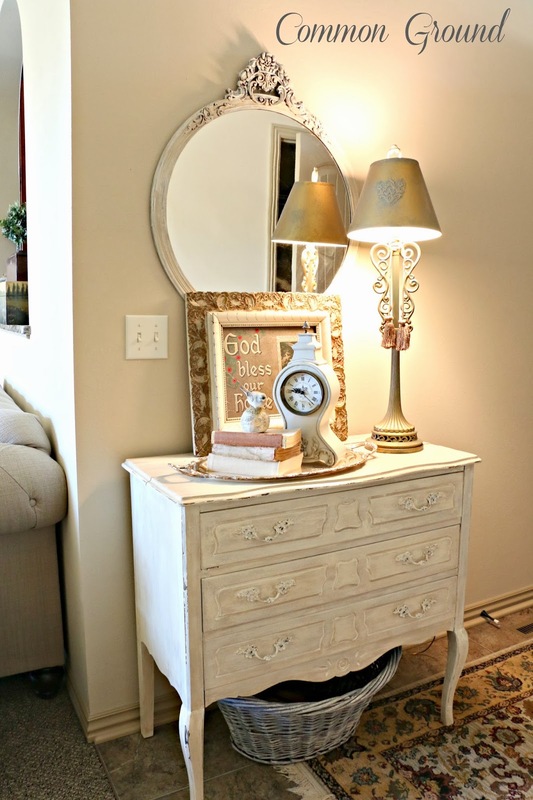 I love how that little dresser turned out! Such a pretty paint finish. I remember several years back we put our house on the market and after it didn't sell for a few months, we decided to stay put. 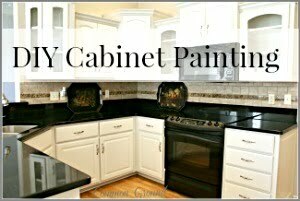 We then upgraded our floors, countertops, backsplash etc. It was nice to just do that instead of moving. But now, we're having to upgrade things that are just getting "old". Not just for cosmetic reasons. Oh well, with homeownership, there is never a day when your house is completely "done"! Your Lefton box is adorable. 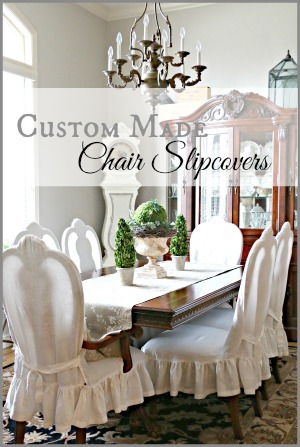 I am so sorry about all your white furniture but I'm sure it will look great. The dresser is a cutie. Everything is looking good! I doubt I'll get around to doing anything for Valentine's Day. I really don't have decor for that holiday for some reason. How are you liking the smaller, cozier digs? 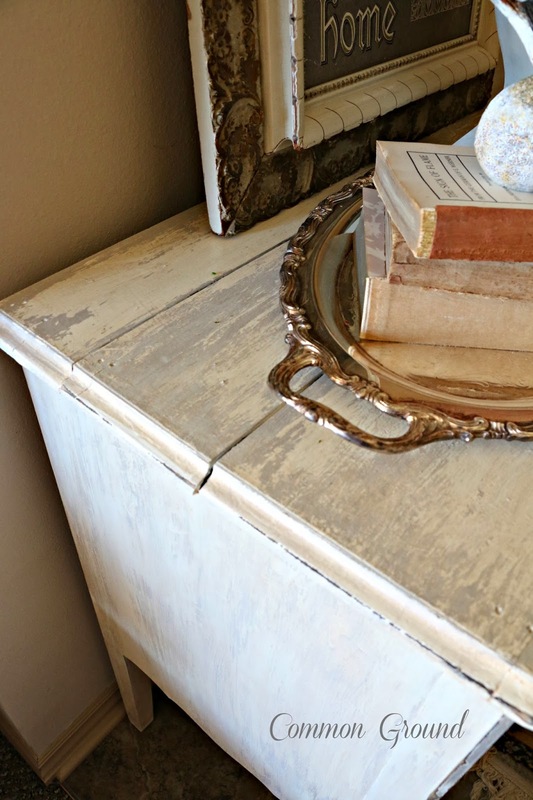 I absolutely adore the taupe/gray wash you added to the dresser! 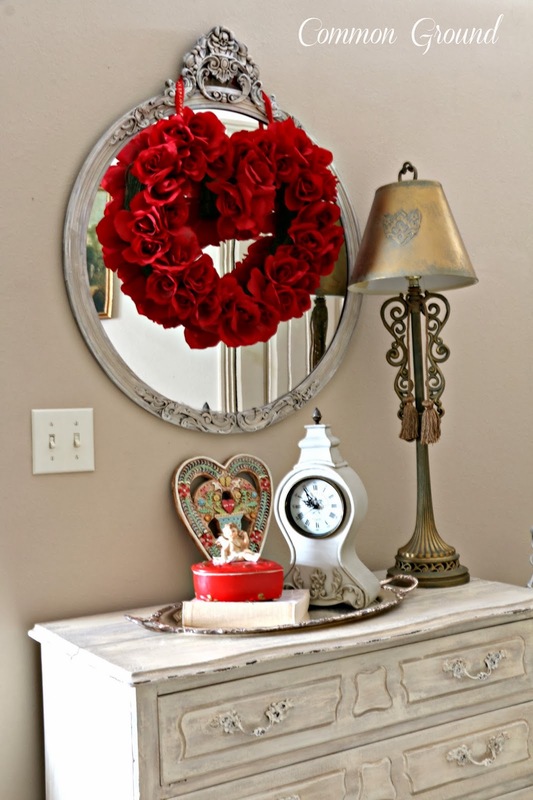 I am totally smitten with the red rose wreath over the mirror, dear friend!!! Nearly took my breath away!!! I think the gray dresser accents it perfectly!!! Kuddo to hubbs...for noticing and telling you what a great job you're doing!!! From my heart~to~yours. . .Happy Valentine's Day! I love the dresser, Debra, it's just perfect. 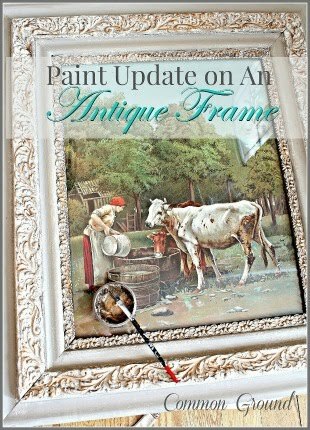 I don't know many painting techniques, but this is one I would like to try. Your Valentine's Day decorations are a nice touch. I love how you are making this house more homey with each day. Debra, I love the finish of the dresser. It looks like it took years to accumulate! Oh I don't envy your packing and unpacking! 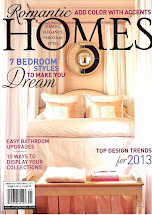 I love watching your progress on making this house a beautiful home! Nice to see a little Valentine's here today. I can just imagine you going through all your tubs of stuff. I guess you saw I shared your Valentine Sunroom from either last year or the year before today. It's too pretty not to be seen. Will your new house have a sunroom when you build it? I do like the grey touches you added to the dresser and it does go better with the couches. Packing is never fun, until you open them again and find new place for a few. 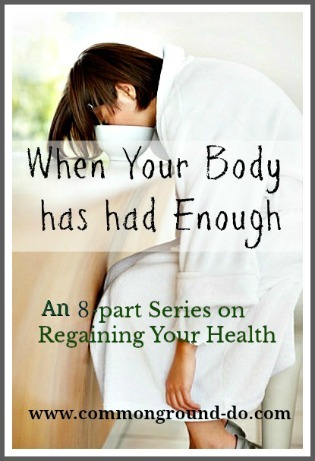 It's fun for us to watch you redecorate a new home, but sure it is tiring for you. Debra, I've come to the conclusion you must possess the world's only magic paint brush. Everything you swipe...regardless what color of paint...with it instantly becomes even prettier. 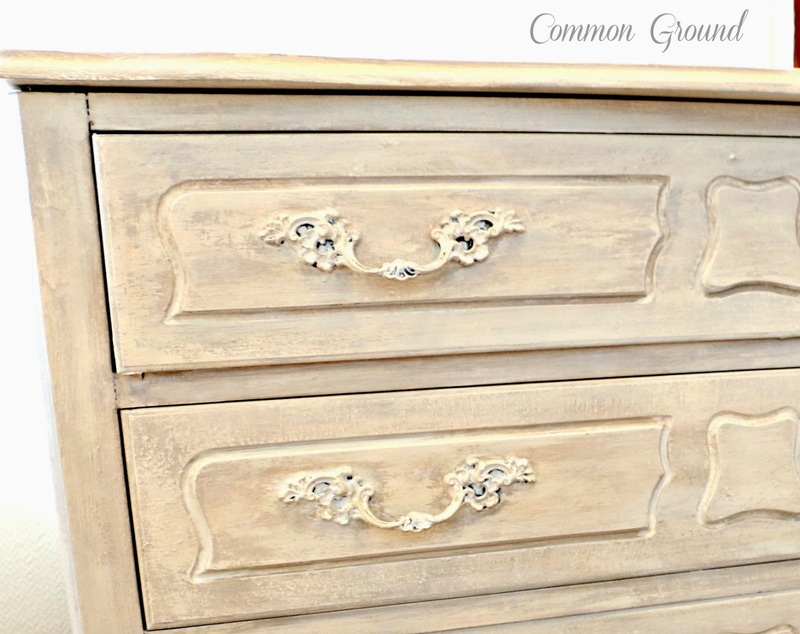 Love what you did with the dresser! The little red box is sweet! 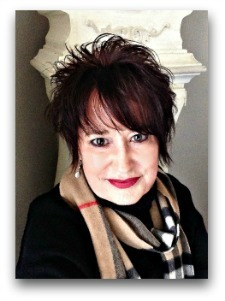 I adore everything you do Debra!! 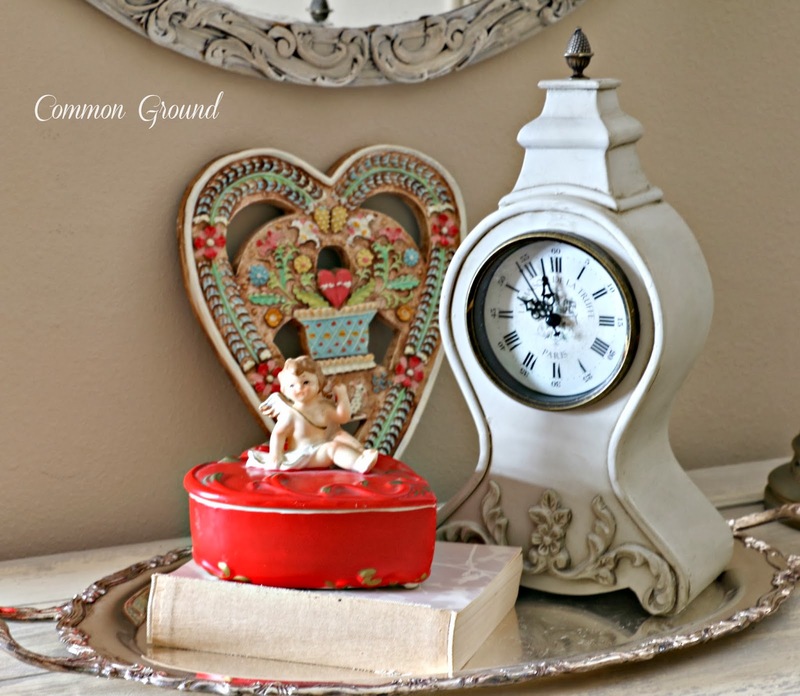 LOVE your makeover on the dresser and your valentine goodies make it look perfect! Very pretty Valentine vignette, Debra! 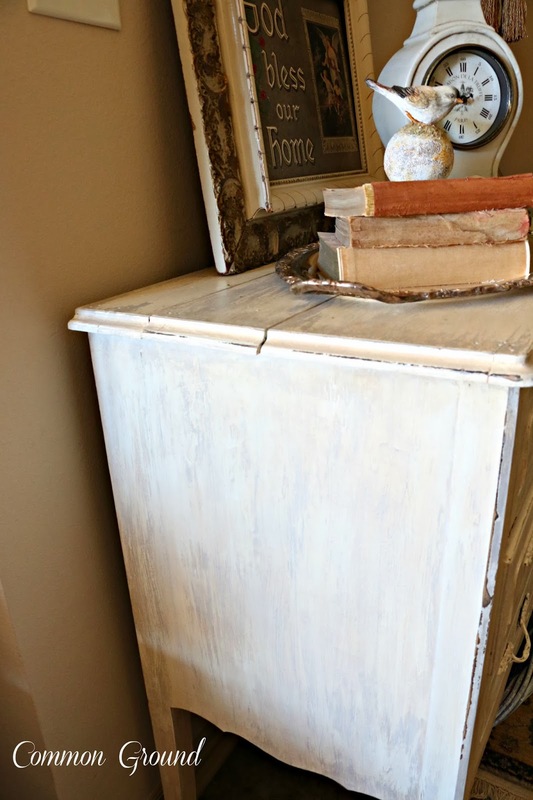 The dresser looks great with the wash.
That is SO pretty, so clean and refreshing. And I love the pop of red color with the wreath and the heart. Charming! I love your dresser and your Valentine Vignette. 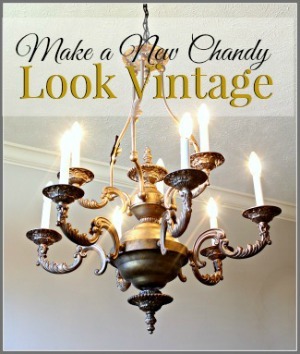 Your new house is looking beautiful with all your special touches everywhere! 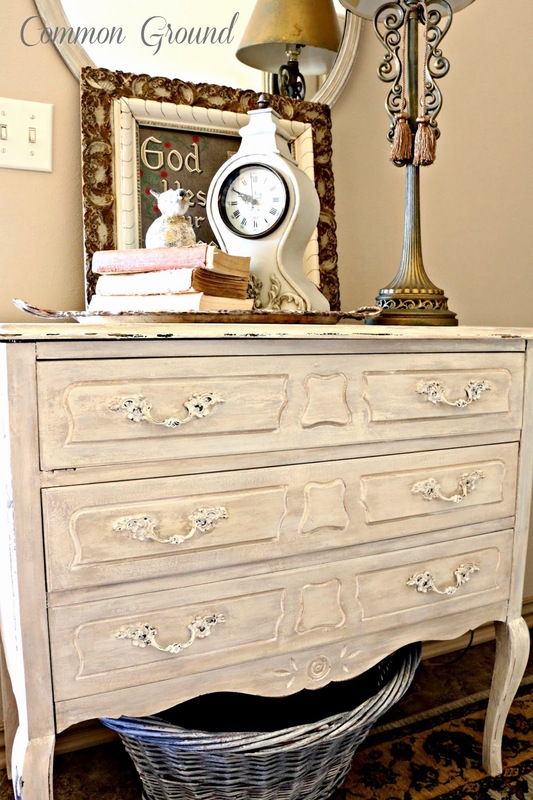 Love the dresser and how you have it styled! Especially that heart leaning against the wall! Everything looks so pretty! It's kind of strange and amazing how a place that you loved so much becomes "not home anymore". Isn't it? That happened to us when we decided to move from our house in Oklahoma. I loved that house so much because we built it and our boys did most of their growing up there. But it's the people who make it home and if things are changing then the house loses some of the meaning that it once had. It's still hard though...I feel for ya. 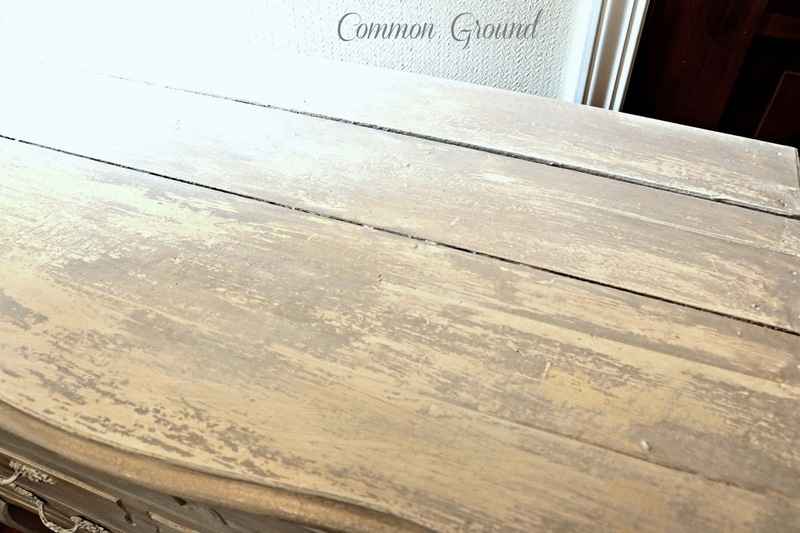 Love what you did with the little dresser. Sometimes simple is best. Looks wonderful. It's all looking lovely Debra! I love the wash you put on the dresser. 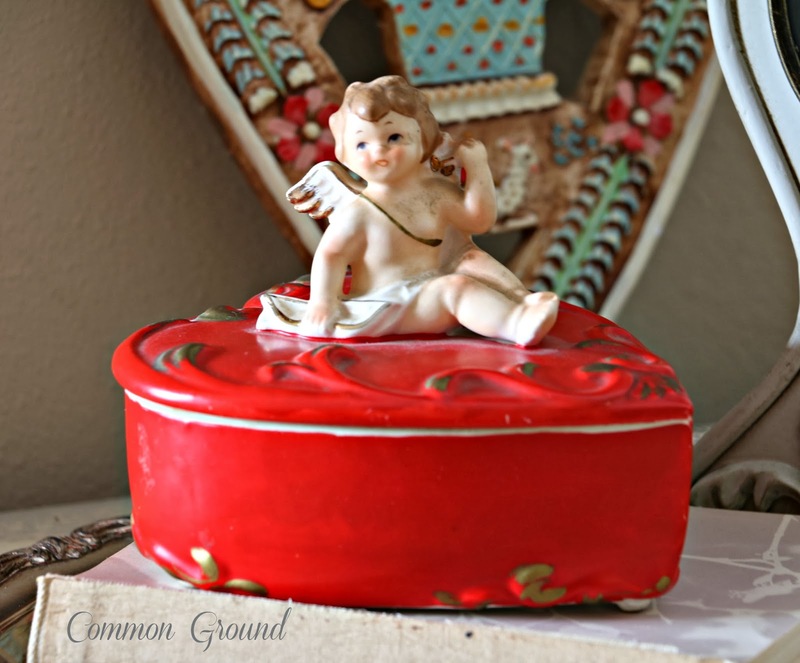 Love the finish on your little dresser and that cupid box is just too sweet! Happy Valentines Day-everything is just so perfect and so pretty! I love the finish on the dresser. 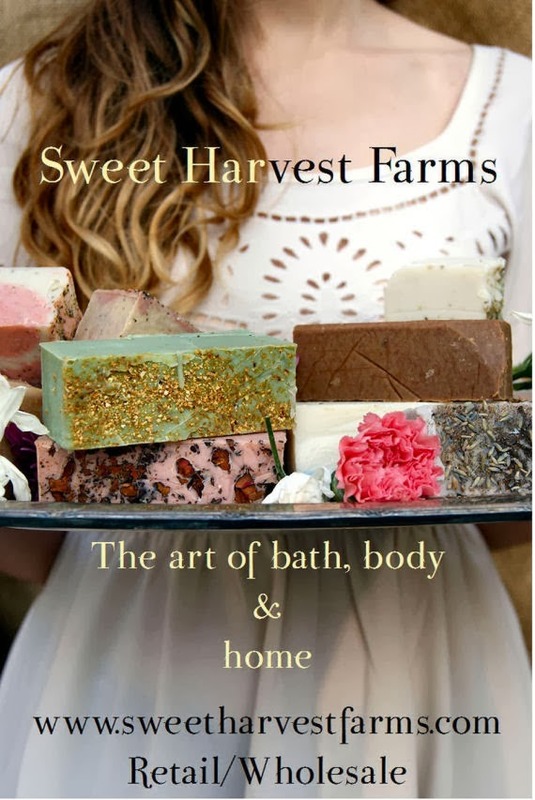 It is so pretty and that little cupid box is too sweet. The whole look of your entry is beautiful. 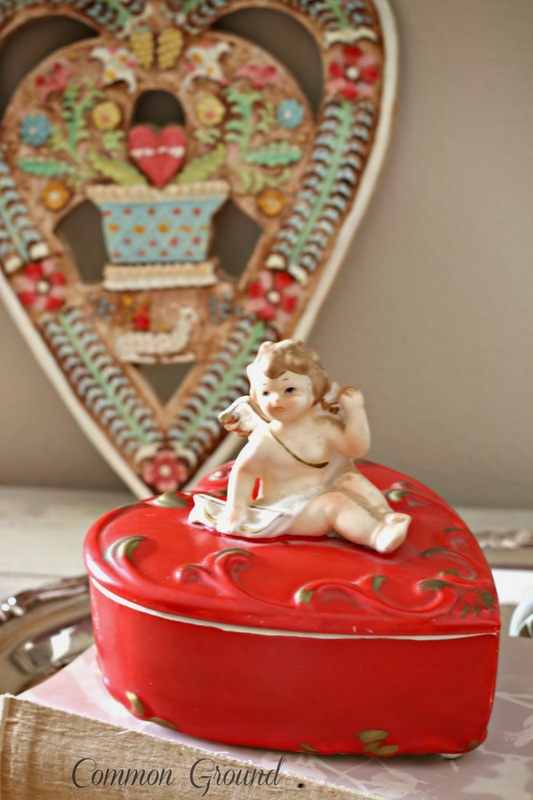 Love your Heart Day touches and that cupid is just too adorable. Still looks sweet to me! Nice that you still have an entry space to dress up. Debra, I love the new look with the dresser! Your Valentine vignette is simple yet sweet. Looking forward to the future is great. Kind of fun! Thanks for sharing with SYC. H Debra, just hopping back to let you know that I will be featuring you at SYC this week. That looks beautiful with the gray wash.